Ross’ book “Heart Shock: Diagnosis and Treatment of Trauma with Shen-Hammer and Classical Chinese Medicine” published by Singing Dragon publications will be available in June 2018. “Heart Shock” will present in detail the myriad components of trauma, establish primary, secondary and tertiary treatment strategies and merge the Shen-Hammer and Classical understanding of this important topic. Diagnosis via a comprehensive presentation of each of the channel systems (sinew, luo, primary, divergent, eight extras) will be provided, as will additional concepts such as gu and gui, Dr. Shen’s nervous system, pulse instruction for all the channel systems, etc. all with extensive treatment options with acupuncture, herbal medicine and essential oil therapies. For some time Ross Rosen has been one of our most important, successful, and innovative pulse instructors. He also has established one of the most successful practices of Chinese medicine of which I am aware so that all that follows in this volume is grounded not only in a profound study of the classics and current scholarship but also in hands-on practice and a background in the martial arts and traditional Chinese esoteric ritual This volume will establish Ross Rosen as a significant Chinese scholar-practitioner of our time and beyond. Heart Shock is one of the most thorough dissertations I have read on any subject in my long career in science. I feel qualified to speak to this subject in particular having been exposed for years to the clinical and conceptual observations on Heart Shock by Dr. John H.F. Shen with whom I apprenticed for many years and recorded them and my own in several published articles. Ross Rosen has placed this chosen subject, Heart Shock, within that context in his first part of this volume. He has then further and brilliantly expounded Heart Shock, synthesizing it precisely within the context of the human organism’s sophisticated defensive system from the Qi to the Blood and Yuan levels as conceived progressively from the Nei Jing to the present as taught by Jeffrey Yuen. The heart/kidney axis is a physiological metaphor for integrity in the core of the self as the confluence of heaven and earth. The inner tradition of medicine recognizes the primacy of this relationship as contextualizing all treatment. In Heart Shock, Ross Rosen has produced a beautiful synthesis of the Shen/Hammer tradition and Jeffrey Yuen lineage as they address this perspective. This will be an indispensible reference text for students in both traditions. For others it will be a beacon toward a much greater depth of practice. Ross’ accomplishment provides inspiration for those of us who strive to be Scholar/Physicians. Heart Shock offers further evidence that the evolution of medicine is in good hands. Two important currents of Chinese medicine are living in the west at this point in history. They are the schools of Shen-Hammer and Jeffrey Yuen. I say this because of the widespread influence that both traditions of thought enjoy, but also because they are the primary tools that inform the work of Ross Rosen. Heart Shock attends to the medicine in ways that are both illuminating and practical. It holds power to reclaim the heart for the medicine and the patients who find themselves in the care of practitioners who use this work. Articulate and well-written, it contains treatments and strategies that are exemplars of these two living traditions of Chinese medicine. Based on the fundamental concept of resonance (gan ying), many Asian medical traditions can be seen to be organized around the idea that the Heart is the “Emperor” of each individual’s life. Heart Shock explains how this perspective can enlighten our understanding of almost all health challenges, perhaps even more so in contemporary times than in some less stressful eras when social roles were less fluid. Even within Chinese medicine there are differences between lineages of various teachers. 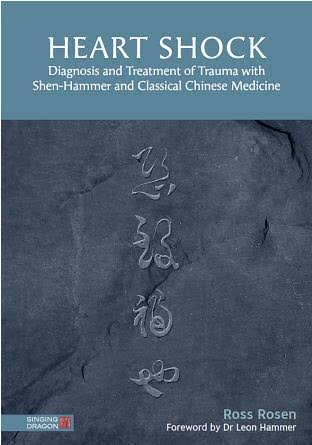 Ross Rosen has done an admirable job of synthesizing the Shen/Hammer and Jeffrey Yuen styles ofdiagnosis and treatment. Heart Shock is both an introduction to, and a fully fleshed out primer on these approaches. Having been a synthesizer of disparate Asian medical systems myself, I must congratulate Ross Rosen on his unique accomplishment, bringing to light information that has never before been integrated into a coherent resource for students and practitioners alike. This is a very valuable book. ‘Heart Shock or Trauma’ was first coined by Dr. John HF. Shen who belongs to our Menghe-Ding Lineage. Dr. Leon Hammer (whom I have been fortunate to know and read his publications) was Dr. Shen’s apprentice, and with the advantage of being both a psychiatrist and a Chinese doctor has raised the scope of knowledge to new heights. Ross Rosen’s manuscript builds on this information. After reading it I can’t help admiring Ross Rosen — without his diligence and wisdom this book could not have been completed. The book shows a full range of levels beyond the ordinary. It offers the reader both an ability to understand the concepts surrounding ‘Heart Shock’ and also provides detailed explanations of the many healing strategies and treatments. It is worth reading for practitioners or students of Oriental Medicine. I will be recommending this book to TCM doctors in China.